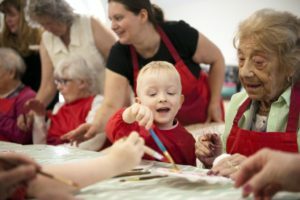 The Creative Learning Guild, a charity based in Yorkshire which supports the grassroots creative learning movement across the UK, has announced today that nominations are open for the new National Creative Learning Awards. As Managing Director of The Creative Learning Guild, Gilly Bryerley, explains: “These new awards are designed to shine a spotlight on the efforts and achievements of the unsung heroes fighting for creative learning. Given that the arts in schools are declining whilst at the same time the creative industries are the fastest growing sector in the country, we need some dynamic and visible support for the people who keep creative learning on the agenda. The judging criteria have been influenced by educators and practitioners themselves, and these are the first awards of their kind that bring together creativity and learning under one supportive and cohesive force. The nomination system is based online, so people and organisations can join the Guild to and nominate inspirational people and projects from anywhere in the UK”. The awards range across 21 categories, including formal education, the arts and the creative industries. Nominations are open on 27th September and you join and nominate yourself, friends and projects that have inspired you over the last 12 months in 4 easy questions. According to Ruth Gamble, Head of Programmes: “The Guild is a fellowship; a membership of passionate and like-minded people. By becoming a member and nominating their creative heroes, people and organisations are committing to support creative learning, and each other, in this fight for recognition and validation”. Nominations will close on Friday 14th December at 12 midnight. Shortlisted entries will receive an invitation to the Creative Learning Summit to be held in early March 2019.